We have recently had a request from our friend Brima James Kabia in Newton. He would like to set up a dressmakers/tailoring business for young people who have missed out on education. He had asked for manual sewing machines and an electric one plus a small generator. 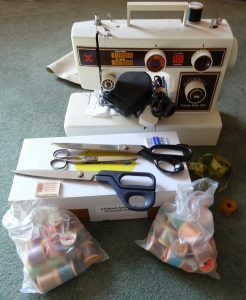 We are delighted to say that a charity based in Chesham – ‘Workaid’ – has supplied us with an electric sewing machine plus an assortment of accessories all free of charge (see photograph). So all the Olney Newton Link need to do is pay shipping costs. The manual machines can be purchased in Sierra Leone. We are looking forward to receiving photos of the workshop in due course – we know it will be a very successful little business and are looking forward to watching it develop. *Workaid tackle poverty by supplying disadvantaged people with the tools they need to acquire practical skills and become self supporting.